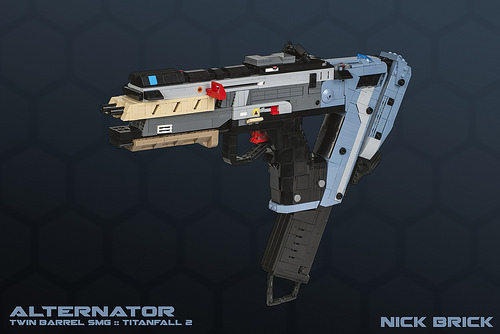 Titanfall 2 added several new weapons to its line-up of futuristic firearms, and my favorites are the multi-barreled weapons like the Alternator for their uniqueness. My LEGO replica of the Alternator started with the grip and mag well, as this area was the most difficult to build for two reasons: First, I wanted the letter “A” shape the body, mag well, and grip form to be spot on. 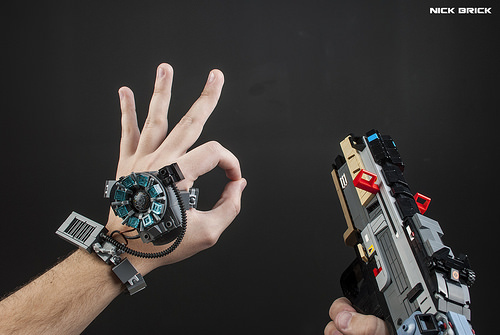 Second, the mag well is sand blue on the in-game model, which has a limited selection of LEGO elements to work with. Considering these limitations, I think my solutions work well for the look of the submachine gun in-game. Though I favor the insanely fast pace and competitive nature of Titanfall 2 multiplayer, its single player mode was a pleasant surprise, and its middle mission “Effect and Cause” is an instant classic. When you retrieve this device and slip it on your left hand, the prompt “Press A to time travel” caught me off guard. Several other players have praised this level, and after building a wearable helmet I wanted to build more wearable objects in full size, so I thought this time travel device would be a fun build. The Alternator SMG model has a moving trigger, sliding ambidextrous charging handle, and removable magazine. See all these functions demonstrated with some time traveling effects in the following two minute video.